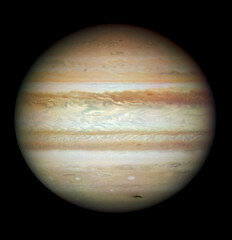 The king of planets, Jupiter, which dominted the evening skies of September and October, is still well placed for obeserving in the evening during this month. It outshines all stars in the sky, so it’s easy to find. Face southeast at dusk. Mars remains very low in the southwest at dusk; it is of only average brightness and hard to recognize. It will be even harder to see in the months to come, as Earth passes around the far side of the sun from it. Venus passed between the Earth and the sun on Oct. 29, an alignment known as inferior conjunction. In other words, Venus has just ‘lapped’ us on its faster, inner orbit. As a result, in November 2010 we see Venus emerge quickly into the morning sky. Face southeast at dawn, especially beginning around mid-month, and you can’t miss it. If you are a consistent early riser, you can do an experiment. Observe the southeast horizon before dawn (5:30-5:40 a.m. once we fall back) and see for yourself when you can first see Venus. Saturn is in the southeast at dawn, above the much brighter Venus. Look for the ringed planet low in the east at dawn. Look for the enormous Summer Triangle, consisting of the stars Deneb, Vega, and Altair, in the west. These stars were up all night long back in June and July, hence the name. The Great Square of Pegasus, not quite as bright as the Summer Triangle, is high in the east at dusk. The star in its upper left hand corner is also the head of Andromeda. Rising after Andromeda is Perseus, the hero that saved her life. Facing north, you’ll see five stars in a distinct ‘M’ like shape—this is Cassiopeia, the Queen. Her stars are about as bright as those in the Big Dipper, and she is directly across the North Star from that Dipper. In fall, while the Dipper is low, Cassiopeia rides high. The vast stretch of sky under Pegasus is largely devoid of bright stars—ancients called this the ‘Celestial Sea.” The only first magnitude star in the entire region is Fomalhaut, in the Southern Fish. Jupiter’s stark brilliance is even more remarkable against this dim backdrop. Taurus, the Bull rises in the northeast. Look for the Pleiades star cluster at the feet of Perseus, low in the northeast just after dusk. New Moon November 5, 11:51 p.m.
1st Quarter November 13, 10:39 p.m.
Full Moon November 21, 11:27 a.m.
Last Quarter November 28, 2:36 a.m.
Sunday, Nov. 7 is the first Sunday of the month. Accordingly, we fall back from Daylight Saving Time to Standard Time on that date. 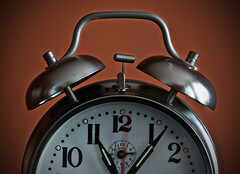 Don’t forget to set all your clocks back on Saturday, Nov. 6 before going to bed. Enjoy your extra hour of sleep! Previous Post The Jolly Roger? Not so Jolly.